Traveling is a journey of self-discovery, seeing a side of yourself you have never seen before. The meaningful moments that you come across in a place you have never been to sometimes point in the direction you have to go from now on. Staying overnight at a calm and serene mountain temple is about “simplicity.” What you eat, what you wear and where you sleep are all quite modest. But it is the surefire way to learn about your true self. Korea Railroad (KORAIL) has provided travelers with a temple stay program for several years, giving them the opportunity to talk to their inner self. The KTX train of KORAIL sets off at 8:30 a.m. from Yongsan Station and takes about four hours to get to Suncheon, Jeollanam-do (South Jeolla Province). Arriving at Suncheon Station, travelers are guided to the tour bus, also prepared by KORAIL, heading to the first destination, Songgwangsa Temple. In Korea, there are three major temples – or jewels – that are often called “sambo.” Sam means three and bo means jewel. Among Buddhists, these temples are each thought to hold a different jewel. One holds Buddha (bul-bo), another his teachings (beop-bo), and the final one his disciples (seung-bo). Bul-bo refers to Tongdosa Temple in Yangsan, Gyeongsangnam-do (South Gyeongsang Province) as it is where the real shrines of the Sakyamuni Buddha relics are preserved. Beop-bo points to Haeinsa Temple in Hapcheon, South Gyeongsang Province, well-known for being home to “Tripitaka Koreana,” the whole of the Buddhist Scriptures carved onto more than 80,000 wooden printing blocks. Finally, Seung-bo is Songgwangsa Temple, that has produced 16 national preceptors. Two of the iconic figures produced in this temple are Bojo Jinul (1158-1210), who made a significant contribution to the development of Zen practice, and Beop Jeong (1932-2010), who taught the public the pleasure of “nonpossession” with his publication, still found in the best-selling section of many bookstores. 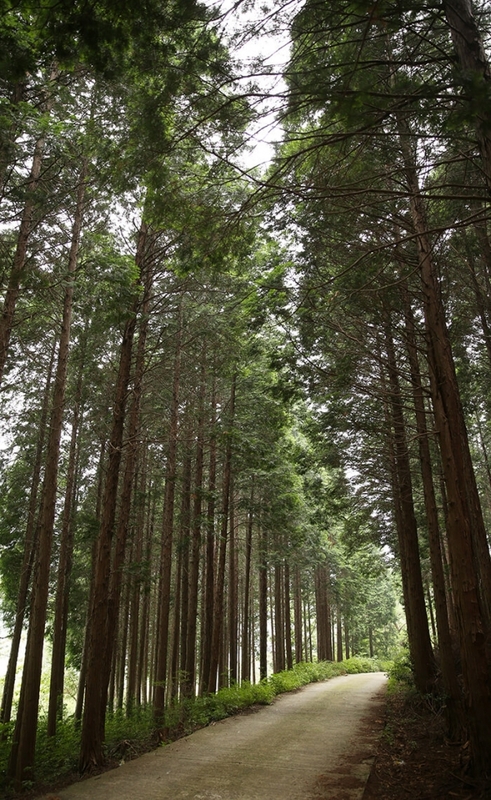 Thick pine trees lined both sides of the entrance, giving off scents of freshness. 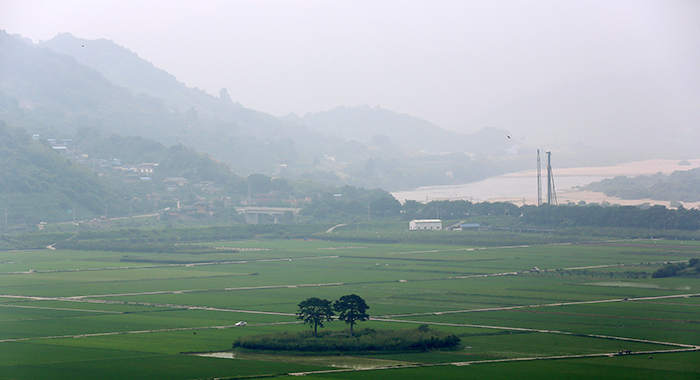 The path is met with a round pavilion bridge called Cheongnyanggak over a valley, the first gateway to the temple. Inside the roof are two dragons, the one situated toward the entrance side has marble in its mouth while the other one on the opposite side and facing towards the temple does not. This suggests that visitors should enter the temple with an empty mind, but should be disciplined at the temple and return with knowledge and wisdom on their way back. Each building or hall in the temple has its own roles and functions to play. The main building that visitors can see at first glance is Daeungjeon, the largest hall with a double roofed appearance. It is where monks and Buddhists can pray and perform the practice of 108 prostrations. Gwaneumjeon building, left of Daeungjeon, is where the Buddhist Goddess of Mercy is. This hall is decked out in beautiful and colorful prints of flowers and birds. It is said that Queen Myeongseong paid several visits here to pray for the stability of the nation and the safety of King Gojong (r. 1863-1907). 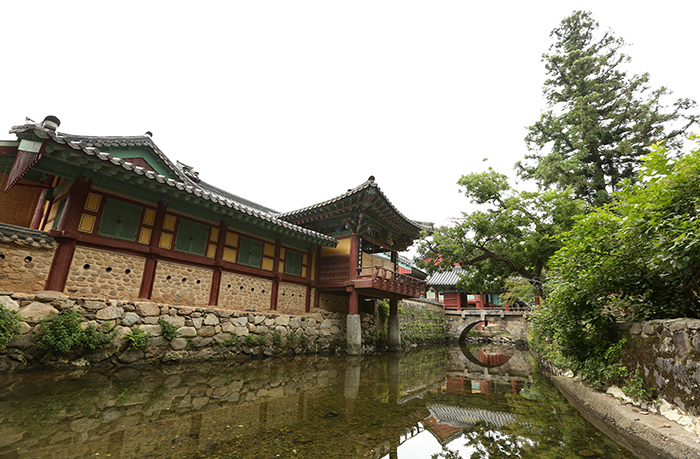 The second stop of the trip is Heungguksa Temple, where travelers stay overnight. It is located at the tip of the Yeongchwisan Mountain, one of the many branches of Baekdudaegan that runs along most of the Korean Peninsula, and is at the meeting point of the two small valleys of Yeongseonam and Jeongsuam. The temple was established in 1195 by Bojo Jinul in the hope of tightened discipline among monks as well as for the whole nation. “Heung-Guk,” itself has the meaning that the nation will prosper. When the two large doors of the temple are pulled open, two Shaggy dogs, or sapsalgae in Korean, designated as the national treasure, welcome the travelers. The 24 hours at the temple seem very slow at first, but they actually fly away. A day at the temple begins at 4 a.m. with the tolling of a majestic bell and people gather at the main hall for the morning ritual. The sound of the throbbing Dharma drum reverberates across the crisp and clear air of the peaceful mountain. All visitors follow a set routine: they have morning monastic meals at 6 a.m., offer a prayer at 10 a.m., have lunch at 12 p.m., have night meals at 6 p.m. and perform the night ritual at 7 p.m. The rest of the hours can be spent walking around the back of the mountain, performing Zen (seon) meditation, or having conversation with monks. You can’t get into the main hall through the door in the center of the building. You should always enter the hall through side doors. It is customary to place your shoes so they face outward and are easier to put on when you leave. As it’s a sacred place, you should always talk and behave quietly. Be careful even for your heels make sounds when touching the floor. When others are in the middle of prayer, Zen meditation, or reciting a sutra, you have to pass them in the back. If you are drunk, you are not allowed to enter the temple. Drinking alcohol, eating meat and smoking are strictly prohibited at temples. After the night meal, travelers are invited for tea time with a monk. 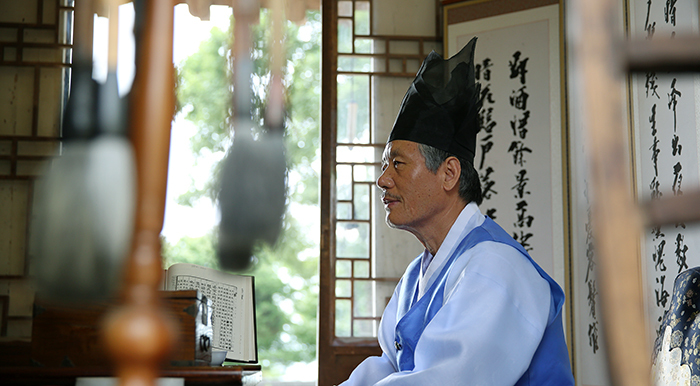 “At the temple, I hope you learn wisdom and life skills rather than intellectual knowledge about Buddhism,” said Monk Yeongin at the Heungguksa Temple, listening to the worries of every single visitor and offering advice late into the night. On the second day, the tour bus heads for Hadong, South Gyeongsang Province. When crossing the boundary between Jeolla Province and Gyeongsang Province, visitors are encouraged to choose to cross over Yi Sunsin Bridge, one of the landmark structures of Jeolla Province. Constructed in remembrance of Admiral Yi Sunsin, who was born in 1545, the main span length is designed to be 1,545 meters. 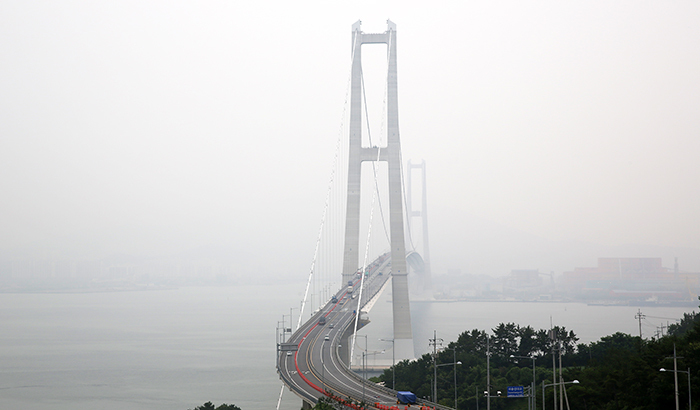 It is the longest suspension bridge in Korea and fourth longest in the world after Japan’s Akashi Bridge at 1,991 meters, China’s Xihoumen Bridge at 1,650 meters and Denmark’s Great Belt Fixed Link at 1,624 meters. This suspension bridge is meaningful because it is the first one completed with Korea’s own technology. The whole process from the beginning of the plan through to design, materials, construction and maintenance was done within the nation. It is currently only possible in six countries, the U.S., China, Japan, Britain, Denmark and Korea. Sometime in the near future, Yeosu plans to establish an observatory at the top of the bridge, allowing visitors a panoramic view of the city. Next stop is the House of Choe Champan. It is the setting of the famous novel Toji (The Land) penned by Park Gyeong-ri. Park reportedly took 25 years to produce the novel. It is a story set between 1897 and 1945 when the nation gained independence. In 2002, the village and the house were constructed for the production of a soap opera. 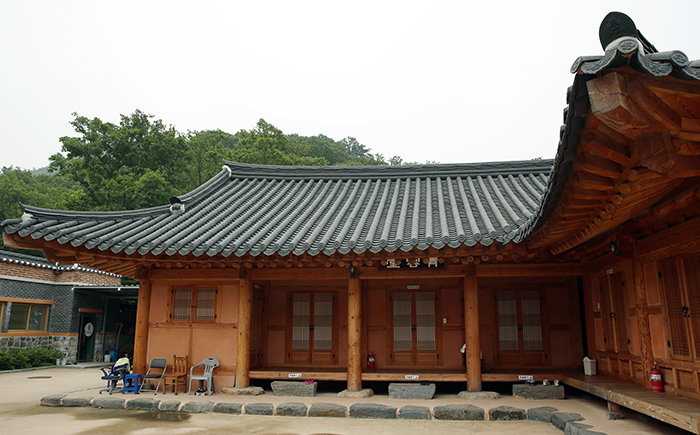 The traditional hanok house of Choe Champan, a government post, is located at a higher altitude, allowing a view of the wide field of Pyeongsa-ri surrounded by the streams of Seomjingang River. Honorary Champan, Jeong Sang-wuk, at the House of Choe Champan provides an explanation about the house and the region to visitors. “This house allows a breathtaking panoramic view of Jirisan Mountain, the streams of Seomjingang River and open wide fields at a glance,” said Jeong. The house also provides deeper insights into Korean traditional culture and history. “How it’s organized with a lofty gate, main building and detached houses etc. will give you a hint on the way of living and the lifestyle of ancient people in the past,” Jeong added. 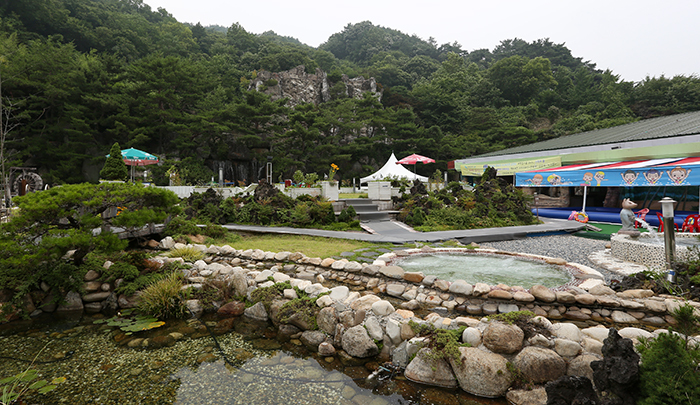 The final stop is Jirisan Spa Land in Gurye, South Jeolla Province. 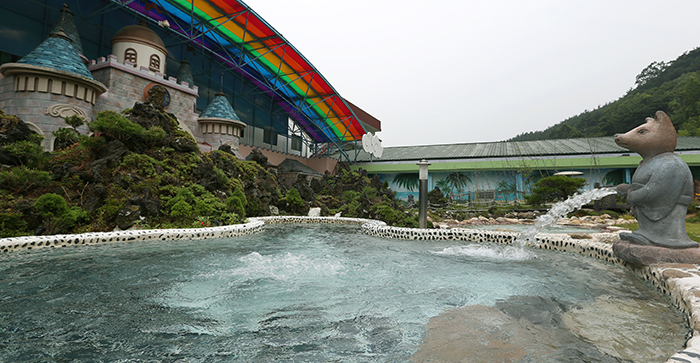 At the large open-air hot spring facility, travelers are given time to soak in hot water, enjoying the gentle breeze in their face and the sound produced by a gigantic artificial waterfall. The trip wraps up at the spa where visitors find relief from the day’s fatigue. *KORAIL’s program is subject to change.